(Nanowerk News) A team of researchers led by Associate Professor Edward L. Webb of the National University of Singapore (NUS) is calling for the global adoption of a method to identify areas that are vulnerable to sea-level rise. The method, which utilises a simple, low-cost tool, is financially and technically accessible to every country with coastal wet­lands. The team seeks to establish a network to coordinate the standardisation and management of the data, as well as to provide a platform for collaboration. The findings were first published in the journal Nature Climate Change on 25 April 2013 ("A global standard for monitoring coastal wetland vulnerability to accelerated sea-level rise"). Sea levels worldwide have been rising, and existing models suggest that up to 20 per cent of global coastal wetlands may disappear as a result of sea-level rise by the 2080s, effectively drowned by rising ocean levels. The trend, linked to global warming, could lead to massive economic and societal costs through increased vulnerability to extreme events, such as cyclones and tsunamis. It could also put millions of coastal inhabitants at greater risk from the loss of direct and indirect ecosystem services that support livelihoods, as well as protect and stabilise shorelines. Recognising that some wetlands may be able to keep up with sea-level rise, the research team argues that scientists must quantitatively evaluate which wetlands may persist in the future, and which may be most threatened by sea-level rise. Although the science behind the tracking of sea-level is well-advanced, a large gap exists in the measurement of the biophysical processes underlying the vertical movement of coastal wetlands, so it remains unknown which coastal wetlands will be most vulnerable to future sea-level rise. Collection of relevant data across global wetlands is critical to informing not only local policies, but to generating more realistic regional-level predictions to inform costal management and policy. 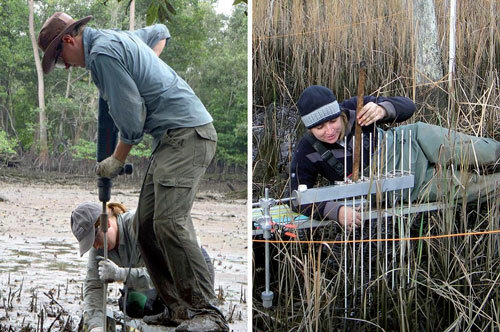 In a bid to address this gap, the research team, comprising members from NUS and the United States Geological Survey, argues for the widespread adoption of a standardised, simple and inexpensive method to measure the vertical movement of coastal wetland surface and its constituent processes that determine whether a wetland can keep pace with sea-level rise. The method utilises a rod surface elevation table (RSET), in which a benchmark rod is drilled vertically through the soil down to the base of the mudflat. A portable horizontal arm is attached at a fixed point to measure the distance to the substrate surface. The RSET is thus a permanent reference point to measure the rate and direction of the mudflat’s surface movement. This very simple and affordable tool can be extensively replicated, thereby providing critical data on the geomorphological processes contributing to the surface elevation change at a site. The data can then be used to make inferences about a site’s long-term vulnerability to sea-level rise. Given the low cost of deployment and monitoring, the team argues that the method provides critical data that will benefit coastal conservation. As a part of their research, the team explored the potential for their method to be used as a central data collection for a large network of wetland monitoring programmes within Southeast Asia and globally. Assistant Professor Daniel Friess of the Department of Geography at the NUS Faculty of Arts and Social Sciences, who is the second author of the paper, has installed initial RSET monitoring stations in Singapore and Thailand with support from the Singapore-Delft Water Alliance. Other co-authors from the US Geological Survey have also installed several RSETs in the Asia-Pacific region. The team envisions a trend of expanded coastal monitoring in the South and Southeast regions of Asia, and they aim to have Singapore and NUS as a leading partner in evaluating coastal vulnerability in the region.